Blood orange season usually begins some time in January, offering a zesty kick to post-Christmas healthy eating plans. 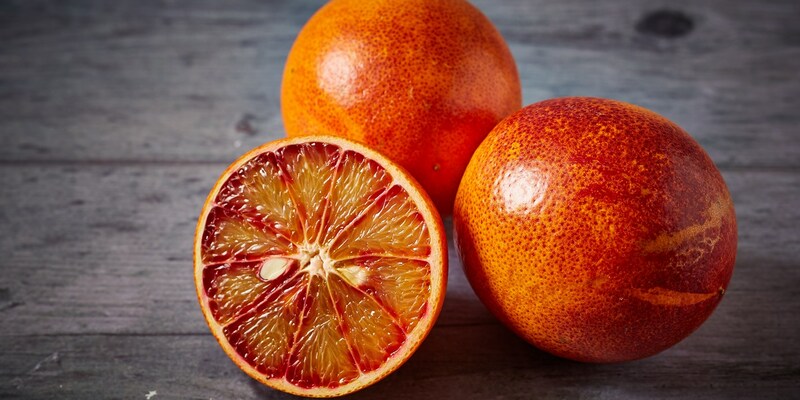 The vivid flesh of a blood orange is similar in appearance to grapefruit, although their taste is considerably sweeter, with a subtle citrusy tartness that lends itself equally well to sweet and savoury dishes. Blood oranges are usually at their best around February; look for fruits which are firm, heavy and have a decent blush to their skin. This collection of blood orange recipes demonstrates some of the fantastic, varied uses for the fruit. While Galton Blackiston prepares a delicious Blood orange sorbet to go alongside his Blood orange mousse recipe, many other of our chefs opt to pair the fruit's tangy flavour with savoury ingredients. Francesco Mazzei's blood orange salad perfectly balances the creamy richness of burrata cheese in his Italian starter recipe, while Richard Corrigan incorporates blood orange into his seafood starter dish of scallops, shrimp and salsify. For a wonderfully quick and easy side dish recipe try Ollie Moore's colourful Chargrilled radicchio, finished with a syrupy blood orange dressing.